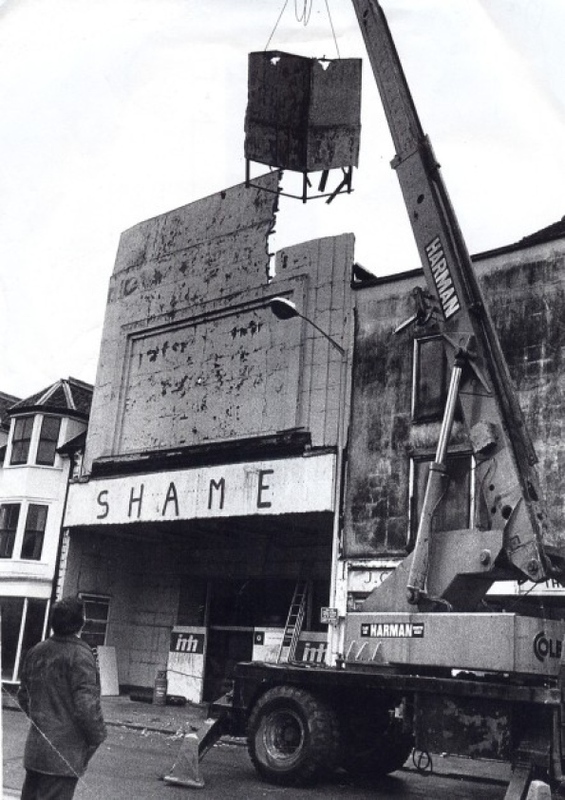 Lewes loses its cinema. Oh well... from Sussex Express. Appropriately one of the movies that kept turning up when I was a kid was Losey’s film of The Go Between. This was in the days when cinemas could bring back popular films endlessly. We had a sort of rota that changed little over the fifteen years between 1964 and 1979. Titles would get added or fall away as they became rather too long in the tooth. At various times the list included, Tom Jones, The Italian Job, Blazing Saddles, Freebie and the Bean, The Sound of Music, any James Bond, any Clint Eastwood, Ring of Bright Water, Born Free and quite a few others. This was a time before video and when movies on television were old or not very good. It’s difficult to imagine now, but the whole country stopped for the first UK television screening of Jaws in 1981. I remember it very well, nobody turned up at all that evening and we all went home early. Rather than see something new, millions of people stayed home to watch a six-year-old film, with commercial breaks and half the picture missing. Jaws is in ‘Scope, and in those bygone 4:3 TV days you only saw half the frame of a film shot in that format. There was a fabulous moment of schadenfreude when our local station TVS lost sound for a full fifteen minutes at the start. That’ll learn ’em. This all sounds rather wonderful and a world in which we have the films all to ourselves would obviously please cinema owners, but there were bigger problems in those days for independent cinemas and even for some circuit cinemas outside really major towns. This was the heyday of the tyrannical sales manager, every distributor had one, and they had a bunch of rules and “gentleman’s” agreements in place that kept a tight reign on who could show what film and when. Foremost in this system of control was barring, a quite arcane set of rules that determined where a cinema sat in the pecking order. It worked like a hierarchy, and Uckfield was quite a few branches down the tree. If your cinema was barred by another it meant you couldn’t play a film until the “barrer” had finished with it. Around here, Brighton and Tunbridge Wells were the kingpins. Which put Uckfield in a kind of barring sandwich. Brighton barred Lewes, which had an Odeon at the time. Lewes in turn barred Uckfield. It didn’t end there, Tunbridge Wells barred The Regent in Crowborough which barred Uckfield. So that meant Uckfield couldn’t date a film until all of the above towns had finished with it. Oddly, Uckfield barred Edenbridge. The big towns like Brighton also had to wait until the West End of London had finished their exclusive run. Sometimes that would be a few months. There were also more cinemas in those towns, where there was a micro pecking order. Second and third run halls also had to play. The upshot of this was films that played in Uckfield were already rather knackered. It was not unusual for it to take a year for film to arrive in Uckfield. Can you imagine? We’d just be getting around to The Social Network about now. Now the world was a different place then, people didn’t travel between towns in quite the cavalier fashion they do today and there was an element of captive audience about the local population. But that population was quite small. It’s amazing we’re still here. To add to the confusion there were also something called a concurrency. Eastbourne’s status was concurrent with Brighton, which meant if Brighton decided to wait for a film, Eastbourne had to as well because they couldn’t play before. All over the country this network of restricted practice spread out from London like a nasty weed. My dad was an expert on barring for some reason. His geographical knowledge of Britain was defined by it. Name any town and he could tell you which other towns barred the local cinema. It kept him amused. In a strange twist of fate, one of the reasons we are still here, aside from a pig-headed tenacity, is precisely because those rules were strictly enforced. If you’ve been paying attention you will have noticed we were not officially barred by Brighton or Tunbridge Wells. These were indirect bars, via Crowborough and Lewes. When both Crowborough and Lewes lost their cinemas in the early seventies, voila, no bar on Uckfield. Suddenly we were able to show films much closer to their London release dates and the opposition was much further away. Business shot up and here we are today, still trying to make sense of it all. Love your blogs! I just turn up to watch a film with no knowledge of the shenanigans that go on!…… better than some of the film plots! You see, it’s not all glamour in showbizz! Agreed with Jennifer, these blog posts are great and really do make fantastic reading. I dunno when the Heathfield cinema shut, but this has finally put to bed why cinemas such as these closed down back then. However, I wonder how much longer they would’ve survived even if these ridiculous rules were not in place. Heathfield shut a long time ago. In fact the person who had Uckfield before us had it. I understand it had a tin roof which caused major sound problems when it rained. Loving the blogs Kevin. Great behind the scenes insights. I must say, growing up in Uckfield, we were used to having to wait for the films & just accepted, that that was the way it was. Interesting now to learn the reasons why! Nowadays, although I don’t get to the cinema as much as I’d like to, I can’t help being impressed when I see The Picture House in our little town, is showing the latest blockbuster, as soon as it is released! An excellent insight into the world of cinematic hierarchies. It has the distinct flavour of the public school bully network. Uckfield Picture House by its name alone carries the sense of a bygone age.